Like many websites, the USF website features a text only version of the site that has been optimized for screen readers. This tutorial covers how to access the text-only version of the USF website with NVDA, but the navigation shortcuts will work on any website. Open Internet Explorer. To do this with NVDA, move the cursor toward the bottom of the screen until NVDA announces it is on the task bar. The shortcut for Internet Explorer is on the left side of the task bar. Once you locate Internet Explorer with the cursor and NVDA announces the name of the program, double-click with the mouse. To open the program with the keyboard, press the Windows key, type Internet Explorer into the Search box, then press Enter. 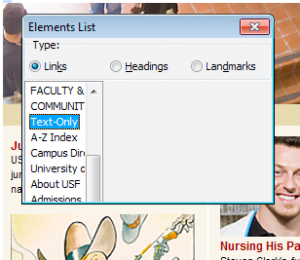 Once in Internet Explorer, move the focus to the address bar by pressing Alt, D.
Type in the address for the USF website (https://www.usf.edu) and press Enter. When the USF website opens (you will hear a tone to let you know you’re on a new page), NVDA will start reading the page automatically. To pause NVDA press Control on your keyboard. You can press the Tab and Shift Tab keys to navigate the links on the home page of the USF website. However, an easier way to navigate is to use the Elements List, which includes a list of all the links on the page. To open the Elements List, press Insert, F7. In the Elements List window, use the Down Arrow to navigate to the Text-Only link and press Enter. This will open the text-only version of the USF website. On the text only version of the site, you can press the H and Shift H keys to navigate using the headings, or you can again use the Elements List (Insert, F7) to select any of the links on the page.